Today we will resume our discussion about the bashraf (pre-composed instrumental form with often quite long binary rhythmic cycles, played as a prelude to the waṣla. The structural pattern of the bashraf generally alternates four khāna-s and the taslīm/ritornello. 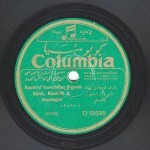 There are other types of semi-composed bashraf-s alternating one or two composed sections and an improvisation in a binary rhythm responsorial between the instrumentalists) qarah baṭāq sikāh by kimānist Khuḍr Āghā, arabised by a great musician whose name we unfortunately do not know. We do not know either when this bashraf was arabised, yet we think it was not too long after it was created, based on data some of which we already discussed. The remaining data will be discussed today or in our next episode. We said that the dialogue evolves from one khāna (section) to the other. The first khāna includes a 16-beat’ dialogue, i.e. a half measure or a full measure since the rhythmic cycle is short, the second one twice the length of the first, and the third one twice the length of the second, i.e. the first khāna being 16-beats’ long, the second would be 32-beats’ long, and the third khāna in full would constitute a dialogue. Or if we consider it as a simple taslīm between the khāna-s, free of a lāzima, i.e. that the bashraf does not include a lāzima separating the khāna-s.
All this is unimportant… We will talk about khāna-s in another discussion. The difference is at the end of the phrase, not at its beginning. In both cases, the response is one fifth lower than the question. This was in the first khāna in relation to which we mentioned that he transformed the dialogue into a collective performance. Because he plays exactly like ṭanbūrist Jamīl Bēk, even if he probably played the bashraf before ṭanbūrist Jamīl Bēk’s recording was made, Ibrāhīm Sahlūn had surely heard its Turkish version, or heard it played live by someone who had decided to play this instead of the first khāna. I think that he most probably heard the bashraf played by a Turkish jawq (ensemble), either by ṭanbūrist Jamīl Bēk or by another. This same phrase was played by the violin and by the ‘ūd, once to the jawāb and once to the qarār. 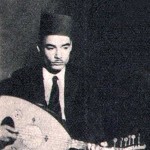 Ḥāj Sayyid al-Suwaysī had either heard it played by someone who was influenced by the Turkish version, or had heard it himself played by a Turkish band. 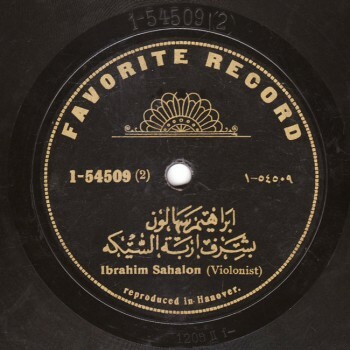 Had Muḥammad al-Qaṣṣabgī also heard it played by Turks or by Ḥāj Sayyid al-Suwaysī? I think he probably heard it played by Ḥāj Sayyid al-Suwaysī, … but then again maybe not. Let us listen to Ibrāhīm Sahlūn’s Favorite recording, then to Sāmī al-Shawwā’s recording made 23 or 24 years later with Muḥammad al-‘Aqqād. Even the way they play the taqsīm-s is influenced by the Turkish jawq-s’ playing, or by their travels to Topkapi among other places. 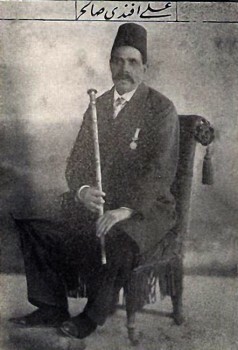 Talking about Topkapi, let us end today’s episode with a pre-WW1 Baidaphon recording, knowing that Baidaphon was established during the Ottoman Empire. 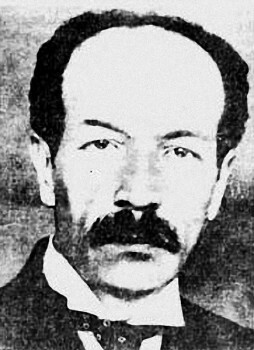 Let us listen to this old pre-WW1 Baidaphon recording with Ibrāhim Afandī Sahlūn (kamān), Manṣūr Afandī ‘Awaḍ (‘ūd), and ‘Abd al-Ḥamīd Afandī al-Quḍḍābī (qanūn). A beautiful piece part of which we had played, adding that the full-dialogue first khāna was played collectively, knowing that the phrase was taken from the violin phrase in the third khāna, as mentioned earlier.